You can’t have effective lighting design until you first know what uses you have to cover and what the desired effect the design will create. What does the lighting need to accomplish and contribute to the space? Will there be natural light? What about video playback? Of course, we like to give you questions as much as answers, so let’s look at what we need to know. What is the budget for lighting design and instruments? What are the various uses for the space? What does the current lighting accomplish? Not accomplish? What does the house of worship want the new lighting design to accomplish? What works and doesn’t work in the space now? If there’s natural light, will it help or hinder? Will there be filming? Is it for broadcast or for the web? What are the different moods the lighting should enhance or reinforce? Does the congregation need to be able to read texts like hymnals or bibles? Where should the congregation (or the camera) be focused? Does that change during the service or event? Is there (or will there be) video playback? Is this or will this be accomplished using TVs, LED video wall or projection? Do they need (or want) moving lights? Is the architectural lighting sufficient? Does the install need to light the building, too? Are there existing places to hang the lights (e.g. a grid or pipes)? Will the install be a fixed plot or will instruments be moved for different uses? Who will be running the install and how will they be trained? Does the budget include ongoing training? How many hours per week will the lights be used? Does the budget include ongoing maintenance and repairs? Who will be maintaining the install? Will special equipment be needed for maintenance? Are the hanging locations going to be accessible? The better your questions and the richer your discussions, the better your plan and solutions will be. You’ll waste less time and have happier customers! You can break the questions into several key areas: uses, what needs to be seen, maintenance, and training. The uses are critical, the more you know about how the space will be used, the better. We’ll go into the first section in more detail here. In a future post, we’ll look at the other three key areas. Question #1: What is the budget for lighting design and instruments? You might as well start with the million-dollar question. Knowing the budget will inform your conversations and nothing spurs creativity like limitations! Many houses of worship expect to spend significantly on their lighting. Some do not. Question #2: What are the various uses for the space? When you consider all the different uses for a house of worship you start to see many are very busy indeed. 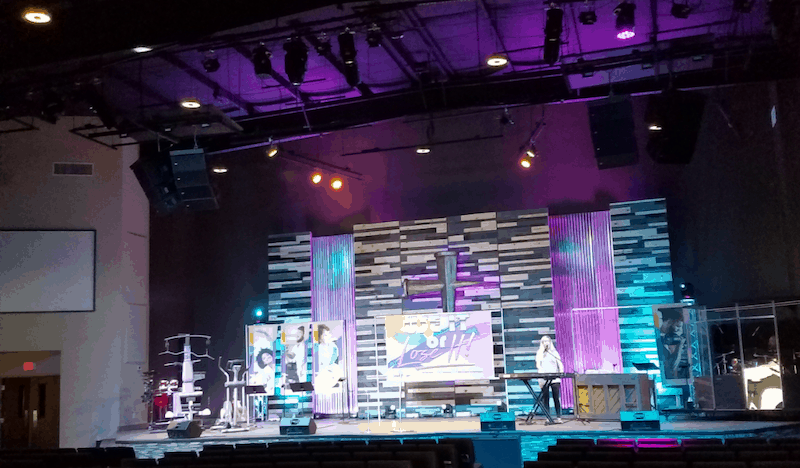 Between weddings, worship, broadcasts, theatrical events, funerals, and new uses that are being devised all the time, the lighting install needs to take all of these into consideration. Plus, unlike a convention or hotel space, most uses will expect to utilize the house lighting equipment. Houses of worship require a versatile and effective design that is as robust as any install there is. Question #3: What does the current lighting accomplish? Not accomplish? Unless it’s a completely new facility, it has some level of existing lighting. Does this accomplish some of what the customer needs? Is it a tweak to an existing install or is this a soup-to-nuts design? Question #4: What does the house of worship want the lighting to accomplish or affect? They may not have thought about this at all, yet, or they may just be at the beginnings of this. Here’s where you get to shine by really digging in to what they want to accomplish. Consider the moods and the emotional connections that the worship team is looking to convey as you discuss this aspect. Question #5: What works and doesn’t work in the space now? Like question three, the space itself has pros and cons or as we like to call them “unique characteristics.” (Also referred to as, “how the crap can we light that?”) In all likelihood, you’re not going to be able to change the layout of the space, so you will need to consider how you can minimally impact the architecture of the space while enhancing the effects that modern lighting design can provide. Question #6: If there’s natural light, will it help or hinder? Natural light can solve some real challenges during the perfect time of day… which may occur while the space is empty. Or, you may have natural light that will have an impact on video wall / projection visibility. Be sure to visit the space at various times of day as your design develops, and consider how natural light can impact or enhance your design. Question #7: Will there be filming? Is it for broadcast or for the web? Broadcast and filming comes with a whole host of considerations! You’ll want to think about how many cameras will be deployed and from what position in the space. You’ll also need to consider the different areas that may need to be captured. For example, if there musicians in a different position than the pulpit, discuss their roles in the various uses. Are musicians the focus, or do they play in the background most of the time. Every house of worship is different when it comes to this. Question #8: What are the different moods the lighting should enhance or reinforce? The question of moods pairs well with what they want to accomplish. If they want the lighting to emphasize certain moods; from serene to joyous, determine the level of subtlety they want to employ. If they want to be able to make lighting transitions seamless and not too noticeable, this will have an impact on fixture choice and placement.